CONGRATULATIONS to my sister Kim on the purchase of her BRAND NEW 2016 Honda Civic (North American Car Of The Year) Kim has 6 kids and has been driving a van for over 10 years, She is thrilled to finally be back in sporty car with excellent gas mileage! Congrats Kendra on your brand new 2016 Honda Civic (North American Car Of The Year) This car couldn't fit you better. Call or text Eric @ 419-262-8497 to get yours TODAY? Congratulations Jordan on your Certified 2014 Honda Civic. Jordan came in for service with his beautiful little baby, his car wouldn't go over 20mph and as a delivery driver he needs his vehicle. Jordan wanted a new vehicle but thought he couldn't get one due to being new on the job and challenged credit... Guess again, he drove off with his new car an hour later! 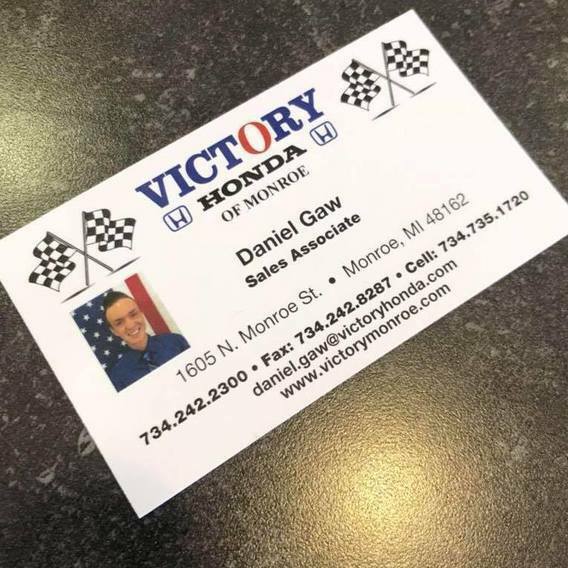 Call or text Eric @ 419-262-8497 anytime for your vehicle needs? <br /> Congratulations Kathy on your Certified 2013 Honda Pilot! The smile says it? Congrats HayleyTallent on your new certified pre-owned 2013 Honda Civic, I'm happy to know you will have a safe reliable vehicle for your big move that's coming up! Best of luck to you? YELLING congrats to my friend Ann Ann Farrell on her 2016 Honda Fit! Ann was a little upset that due to the slight increase in car payment and I do mean slight, that she won't be able to get her Barry Bagels anymore! So I know how much we all LOVE Ann, so anyone that comes in and buys a car from me and gives me her name I will personally send Ann $100 per person! Enjoy your new car Ann, you deserve it and I know you absolutely love it?? Dennis picked himself up a 2013 Honda Fit with only 3200 miles on it. To give you an idea of how much room is in these Fits, this guy is about 6'3 and he still has a ton of room between his head and the roof! Congrats Dennis? Congrats Emma on your 2013 Hyundai Elantra. I'm happy that we got this done for you. Enjoy!!! Congrats Katia on your 2009 Honda Pilot, took 4 days but I got it done. It was a pleasure working with you and meeting your son. I hope you enjoy your new Honda Pilot. Thanks for choosing us for your business! Congratulations to Cara and David Rearick on the purchase of their new 2015 Honda Civic. Cara called me on the phone looking specifically for a 2015 Honda Civic with a great payment. I was able to deliver the car to her within 24 hours at exactly the right price. If you're looking for a VIP experience and a new or used car call Jodi at 734-635-7717 or Eric Frey at 419-262-8497. Congratulations to Ayman Abdalla on the purchase of his first Honda Accord. Ayman was so excited it was awesome to see his huge smile! Thank you again for your business. If you're looking for a great deal on a new or used vehicle, call Jodi Cocagne at 734-635-7717 or Eric Frey at 419-262-8497. Huge thank you to Tim Murphy for his business! Tim got a very great deal on a new 2015 Honda Civic. He is a college student on a tight budget. I was happy to make sure he had an affordable payment. Thanks again Tim. Call Jodi Cocagne at 734-635-7717 or Eric Frey at 419-262-8497. Congratulations to Brandi Sawyer on her 2014 Chrysler 200! Brandi is one of the sweetest ladies I have had the pleasure of meeting. Many customers come buy cars because they want something new or different. Brandi NEEDED this car very much. I will post a couple of pictures of blue for you Brandi on Monday!! Blue was her old 1994 Ford Tempo. Thank you again Brandi. Get a great deal like Brandi call Jodi Cocagne at 734-635-7717 and Eric Frey at 419-262-8497. <br /> Congratulations Amanda Davis on your 2014 Honda CR-V EXL. Amanda was so sweet she is a pleasure to be around! I also got to meet her mom and dad. Now I know why Amanda is so sweet! Thanks also to Chantelle Borawski for connecting the two of us! Call Jodi Cocagne at 734-635-7717 or Eric Frey at 419-262-8497 for all of your vehicle needs. <br /> Congratulations to April Sanchez and her husband Nicholas on the purchase of their new 2015 Honda Civic. I finally got to meet April after helping her over the phone for quite some time. It was thrilling to meet her and her husband tonight. I am glad that they love their new vehicle. If you are looking for a new or used vehicle please call Jodi Cocagne at 734-635-7727 or Eric Frey at 419-262-8497. I love your new truck Chuck Hatch! It was very cool watching you smile from ear to ear today. I'm glad you're happy. You are such of a strong, wonderful person. You always make goals and achieve them. I'm glad to know you. Enjoy your 2015 Beautiful Chevy Silverado. Congratulations to Tracy Micks-Harm on the purchase of her 2016 Honda CRV EXL. Unfortunately Tracy's 2014 CRV was totaled in a bad accident. Tracy is a beloved customer. I was so happy to help her replace her vehicle. Tracy Micks you are absolutely one of the sweetest customers I have ever got to work with. Thank you again for being so awesome. If you're looking for great deal on a new or used vehicle call Jodi at 734-635-7717 or Eric Frey 419-262-8497. Now here is one of the cutest little customers I've ever had. I was able to help her get into a brand-new 2015 Honda fit. She had a 1999 Civic she drove for 16 years. Here is to 16 more years!! Congratulations Mary!! Call Eric or Jodi today! Congratulations to Rosa Edmond on the purchase of her new 2015 Honda Civic. Rosa came from Northern Michigan to purchase this vehicle from me. It was awesome to meet Rosa and her brother! I look forward to helping them out for years to come. If you're looking for a great deal on a great vehicle, call Jodi Cocagne at 734-635-7717 or Eric Frey at 419-262-8497. Congratulations to Lonnie Tackett on the purchase of his 2012 Dodge Ram Hemi Red Wings addition. Lonnie has been looking for a quality truck for almost a year. Eric spent the afternoon with the Tackett family making sure this was absolutely the right vehicle for them. Congratulations again Lonnie we look forward to helping you in the future! If you are looking for a great deal on any new or used vehicle please call Eric Frey @ 419-262-8497 or Jodi Cocagne at 734-635-7717. Congratulations Betty and Roland on your 2015 Honda Civic purchase, I'm happy you found me on Facebook and I was able to meet your needs.